From the Attic: The original Bat in the Attic. A little delayed on writing the last part of the Thieves Guild review. To tide you over I thought to reshare the story of the Bat in the Attic. My house was unusual in that our garage had a full attic. By high school it was used for little more than storage by my family. For me it was great as I could have a table with any game that needed to stay up for a long time. We played many long hours of Dungeons & Dragons. It was a warm summer's night on Meadow Street and there was three of us playing D&D; D, H, and myself. We did not notice that another creature had entered the attic. Suddenly the light from the overhanging bulb flickered as something flew past. Startled we jumped away from the table, "What was that?" H said. "It is a bat!" D said. The bat began to fly crazily around the light. As we frantically waved our hands and rulebooks to wave it off. "How are going to get rid of it!" I shouted. As bat made another turn D reached down and picked up an old book. One of my Dad’s old thick business directories (they were hardcover back then). We stopped and looked at him in shock when he stepped into the path of the creature. Calmly D eyed the bat and readied the book in his hand. At the last possible moment he let the book fly. The three of us rushed up to where the bat laid on the floor. H, looking at the bat, "You got it all-right, I think it is dead." I knelt down and poked it with a ruler. The bat reacted with a gasp. "No it is alive!". D looked at the bat, "Well we can't leave it here and I am not going to go near it." Looking at us two, H said "Well I not touching it." I went to the attic door "We don't need to touch it! I got an idea." I rushed down the stairs to the garage itself where hanging on the walls were the snow shovels. I thought their large flat blades will be perfect for the job. Coming back up the stairs I showed them the shovel. "We will use this." My two friends backed away while I used the shovel to carefully scoop up the bat. All three of us went down the stairs to the garage and then outside into the driveway. In the driveway H looked at the gasping bat "Now what?". D shrugged "It has trouble breathing I don't know blow on it?" We looked at each other and began blowing on the bat. The gasping stopped and the bat began to try to move around. “It looks better." I said "I am going to toss it and help it get flying." The other two backed off, while I started lifting the shovel up and down. "1.. 2.. 3.." and then tossed the bat into the air. Almost immediately the bat began flying, first to the left, then to the right, down a little, and then forward right into one of the doors of the garage! As the bat fell to the ground, H quipped "Well that was good." We advanced on the bat and saw it was still alive. D looked around "Maybe if it had more room?". "Let’s try it out in the street" I answered. Scooping up the bat in the snow shovel, I walked out into the street. "1.. 2.. 3.." and again I tossed the bat into the air. The bat went left, and then went right, down a little, and then forward and flew away up into the night. We cheered and when we could no longer see the bat went back into garage, up into the attic and once again entered our world of goblins, dragons, and treasure. In the last post I talked about the rules and now we get to what is the heart of the book, the scenarios. First off they explain the stat block. Yes Thieves Guild has stat blocks however they are formated to fit on one line. While a bit dense they look straight forward to read and use. Armed Robbery and Pursuit Adventures. The initial part of the chapter explains that the players should pick a time of day and terrain in which to do their activities. The choices for time is Daylight or Night. For terrain the players can pick Clear, Woods, or Mountains. From this the referee rolls to see what is encounters. The possibilities include Farmers, Merchants, Travelers, or Warriors. The initial part concludes with a reminder that there should be the occasional encounter with the local wildlife (i.e. monsters) and that spending too much time in one area means the encounters will get tougher as guards are hired and patrols increased. For Farmers we get a series of short tables to roll up a group of farmers. While farmer do not carry much in the way of luxury good they do have food and livestock that are useful for subsistence. Sometime the players will lucky and the farmer is heading into town to buy something and has gold. The Jewel Speculator (toughest and most lucrative),. The Travelling Players (a theater group). On nice thing about the pre-canned encounters is that they well organized with an initial description of what the players see, a GM section, and the last section (and most important) what stuff they have. These scenarios take place in the City of Haven and we learn bits and pieces of the city we read the different scenarios. Also the scenarios are also more detailed than the Bandit/Highway Adventures. The first one is Heligor's. Heligor's is a jewelry shop on the Street of Silk Veils. The scenario is more than just about the shop itself but spend a lot of time describing the street and the people living in the area.This is important because in order to pull off the job, the players have to case the player and learn the best ways of getting in and out. To do that they need to interact with those that live nearby. Next is Magic Books & Scrolls, It lies also in Haven on Magic Street. Like Heligors it describes the surrounding area. Again the players are expected to case the place and interact with the inhabitants to find out all they can. A complication is that Magic Street is well patrolled by the Constabulary. Next we get into Armed Robery and Pursuit Adventures. There only one scenario called Waylaying the Couriers. But it goes into extensive details on their stops and random encounters on the streets of Haven. Thieves Guild I wraps up the book with a series of encounter maps with some of them keyed with interesting features. A map of the Street of Silk Veils, another map of Magic Street, A map of the courier route and building maps. Finally there are some appendix, one dealing with character conversion from Chivalry and Sorcery, Runequest, ADnD, and Tunnels and Trolls. Then there is several pages of reference charts. A character sheet, and a large scale hex map for miniatures. Tomorrow Part IV which will have my thoughts on Thieves Guild I. So what in Thieves Guild #1? It is basically in two sections, Rules of Play and Scenarios. Richard Meyer and Kerry Lloyd are the authors. Physically the first version of the rulebook is loose leaf punched for a three ring binder. Like Harnmaster and initial ADnD 2nd edition Monster Manual the system is modular with later supplement having new sections to insert among older sections. 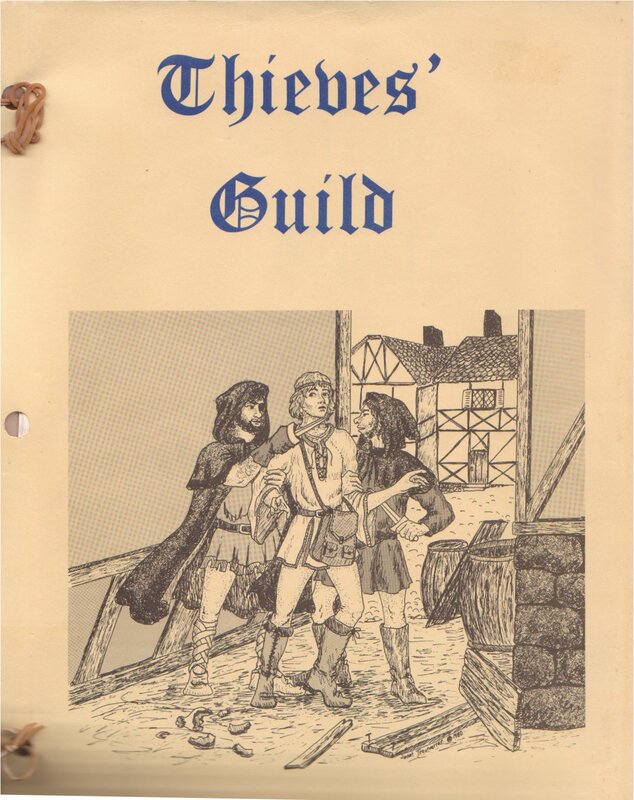 This was also was probably one of the first roleplaying games to laid out and the final copy printed out from a computer. It is laid out using a dense typewriter font that is hard to read. There is a second printing that is laid out more traditionally and a little easier to read. Finally the 2nd Edition Thieves Guild reorganizes the rules and is pretty much as good as any middle tier RPG of the eighties. The art is distinctive with humor and seriousness intermixed. I found myself laughing at some of the humorous illustrations. There are a diverse number of races available to play; Human, Dwarf, Hobbit, Elf (sylvan), Elf (sindar), Elf (noldor), Half-elf, Centaur, Pixie, Orc, Uruk-hai, Half-orc, Kobold, and Goblin. For some reason the Kobolds get illustrated a lot and look like ugly hobbits with really big ears. Orcs are pig nosed btw. The rules distinguish between male and female with bonuses and minuses. Hit points are based on Strength + Stamina /2 + the character's hit dice. The hit dice is NOT based on class but rather looked up on a table that is indexed by the total of the character's stamina + strength. For example a character with a 13 strength, and a 10 stamina has a total of 23 which gives him a d8 for his hit dice. Next is your family background which is rolled using a d1000. The different races have restrictions on which background categories they can take. For example Kobolds can not gain a noble or guild background..
After the family background is determined the character rolls his starting purse (i.e. money). This is influenced a lot by the family background. Also his family background determines the choices he can pick for the weapons and skills he starts with. Thieves guild looks mostly like a skill based system. Gaining levels through accumulating experience is how you advance your skills or choose new ones. The other "classes", Fighters and Wizards, look like they would use the same system as thieves but have different costs and different choices of skills. Not only thieves are ever presented in any type of detail in the Thieves Guild series. Although later supplement flesh out things a bit and Second edition was going be the first in a series of book for the The Fantasy System. Weapons have minimum attribute requirements. For example your basic Broadsword requires at least a 7 Strength and a Coordination. The boardsword does a 1d10 damage and later if the character pays for expertise it can do 2d6 damage. Finally it has a interesting stat called HAC0 or Basic Hit Probability. Thieves Guild uses an Ascending Armor Class system! However there no to hit bonus based on level as there in the D20 system. Instead if you are proficient in a weapon you gain it's HAC0 as your skill. For example the Broadsword has a HAC0 of 8. This means to hit an unarmored man (AC 0) you need a 8 or better on a d20. However if that opponent was wearing Scale Armor he would have AC 8. And the character would add that to his HAC0 of 8 which tell him he need to roll a 16 or better on a d20 to hit. What interesting this works very similarily to DnD Next weapons from the closed playtest. For skills, the players rolls for Training opportunities for his character and add the result to the number of training points for their social class. From that they can purchase various skills. There are are a total of 44. 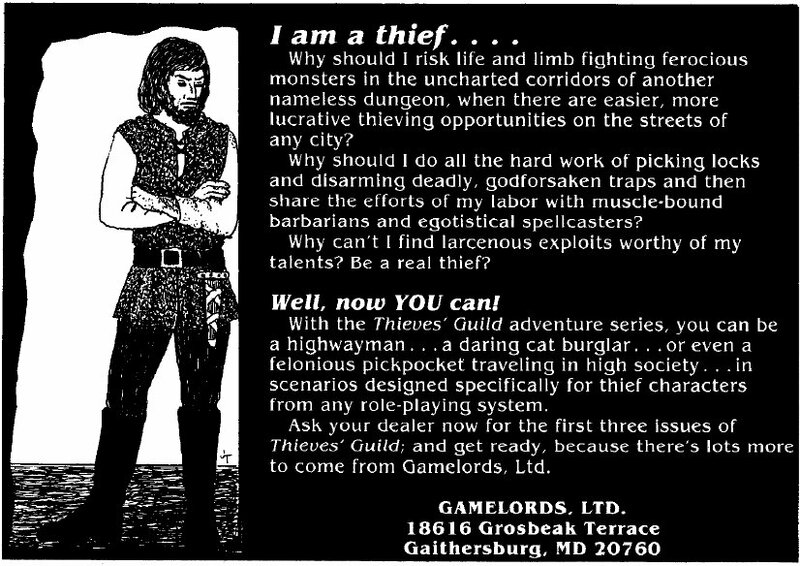 As "The Fantasy Game: still has class and level, the thieves skills are found on a level chart similar to the one in AD&D. There are race and stat bonuses also similar to those found in AD&D. TThe next sub-section is about the rules of play. There movement including outdoor movement. At lot of Thieves Guild, especially in the later supplement, involves activities in the rural landscape as well as the city. Next is combat which takes place in 15 minute combat round on a 5 foot grid. Thieves Guild is loaded with what is now called battle maps. There is no initiative, all fighting is considered simultaneous after movement. If you roll 10 or better than your chance to hit you score a critical hit. Misses that are 10 or less than the chance to hit are critical fumbles. Criticals are rolled on a chart giving a variety of results. Special Combat tactics for thieves are backstabbing, coshing (whacking somebody on the back of the head with sand filled bag), poisoned weapons, and striking from concealment. what happens when you get busted, including individual magistrates. Much of the rest of the chapter gives specific awards for each of these categories. For 1/4 of the GP value of loot fenced. Last is the XP table itself including the advancement in thief skills. First level is 1,500 xp, 2nd is 3,000 xp and roughly doubles every level afterwards until 8th. Afterwards advances by 100,000 per level. Next is Part III the Scenarios! 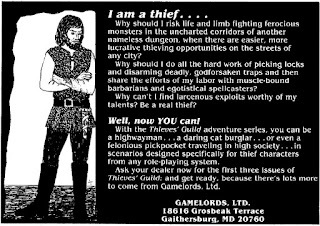 Shortly after I started regularly buying Dragon Magazine (issue #38) I started seeing ads for Thieves Guild like the one below. This interested me a lot, but unlike the Harn Ads I never got the chance to buy any of Gamelords releases except for a few of their unrelated Traveller supplements (they are pretty good). And because this was all pre-internet I never learned what was in them. Even today information on the Thieves Guild Supplements is pretty sparse. Different Worlds has many of the original releases still at their original prices! Finally a year ago, I had some extra money and bought the first two Thieves Guild supplements from Noble Knights Game. While not as cheap as Different Worlds they were at a decent price and more importantly had Thieves Guild 1. Along with that I got Thieves Guild 2. When they arrived I finally found out what was in them. Which I will go over in Part II on Tuesday. What do you want out of a OSR city supplement? Older edition adventures and supplements are far ranging in the situations they depict, yet retain common elements to make them useful to players and referees of older editions. The most obvious one being the statistic presented in a terse format compatible with one of the older editions of Dungeons and Dragons. Compared to other types of adventures and supplements there is a lack of city supplements. A product that details a large settlement for use in a campaign. One of the more famous is Vornheim and it has it's own distinct format. One reason Vornheim is unique and a success is because it more about how Zak runs cities than a physical description of the place. And as it turns out many people found how Zak runs a city is useful to running cities in their own campaign. So.... which lead me to the question asked in the title of the post. What to you want out of a city supplement written specifically for the OSR? Other than everything stated for older editions of DnD. Off the top of my head here are some things that could be in such a product. A physical description of the settlement, the traditional map with a number key followed by a description of each locale indexed by said number key. What I been called a sandbox of NPCs. Basically a list of important and interesting inhabitants with descriptions and just as important how they interact with each. Referees can use this for campaign focused more the adventure that arises out of meeting people and dealing with the complications that arise from that. Basically what would make a city supplement more useful to you as a player or referee of older editions compared to say Cities of Harn, Chaosium's Thieves World, etc. Finally if you like Vornheim or want another good resource for refereeing a city in a campaign I recommend getting Midkemia Press Cities. I think I was their first PDF customer as they just sold out all the physical copies. Not only I got it I use it. It basically three sections, one is an outstanding series of random encounter charts for cities. The second is what they call character catch-up, basically a series of guidelines and charts to find out what the character been doing in between sessions. The last is a series of city building guidlines and charts. I printed these up as three digest size booklets and they been working out great. I been at this module/supplement forever but I finally buckled down and began a serious push to get it finished. Now all 13 mages of the Golden House are statted up and detailed in the supplement half of the book. The Golden House, a conclave of Thothian Mages, is the last section of the book and once that done I will be able to produce a 2nd draft and start having it edited. One reason I decided to it this way is so that the book has utility beyond the adventure itself. It is two halves, the adventure and supplement. 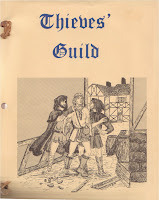 The adventure is tersely presented like the best OSR adventures, while many of the locale are fleshed out in more detail in the supplement half. It not necessary to read the supplement half run the adventure but will aid greatly in using it as a resource for further development in the campaign. For your use and enjoyment here is the one of the mages I just wrote up. Note if you don't have my Majestic Wilderlands supplement just use him as a straight magic-user and ignore any MW specific stuff. Ritual is the amount of silver in ritual component used to cast spells out of the spell book (takes ten minutes). ABL are abilities bonuses for the skill system I use. Vis is magic in a physical form and I talk about it in Blackmarsh. The Magic Items were generated from a chart I am working on. It based on the idea that 20% of a character XP will represent the equipment budget of a typical character of that level. I then use the Magic Price List I created to come up with the actual items. Master Numford is the senior master at the Golden House having been in residence for nearly fifty years. He is also the last member of the Golden House to have been apprenticed by the original founders. He no longer cares much for politics, inside or outside of the Golden House. Instead he has turned his attention to Portal Magic specifically looking at ways to pierce the void and connect to other worlds. He is intently interested in any tales of inter-world travel and more importantly how they managed to enter the Wilderlands. Year by year this research has become his all consuming interest. He wears a fur lined Robe of Wizardry while wielding a Staff of Wizardry, he wears the traditional pointed wizard’s hat despite it going out of style in the last century. Most don’t like looking into his eyes; one apprentice said “it was like looking into the wells of infinity”. In your mind what makes a setting Swords & Sorceryish versus Dungeons & Dragonish? For me it brings up dusty windblown cities on the edge of the desert with the ruined piles of the past dotting the landscape. Something like our world's Mesopotamia. Where the characters are mostly fighter and thief types. In the concluded Swords & Wizardry Campaign, I ran an adventure in an old abandoned Hill Fort that was rebuilt into a base for the PCs. Dwayne of Gamers Closest is think about using his recently acquired Hirst Art Molds to build it up. 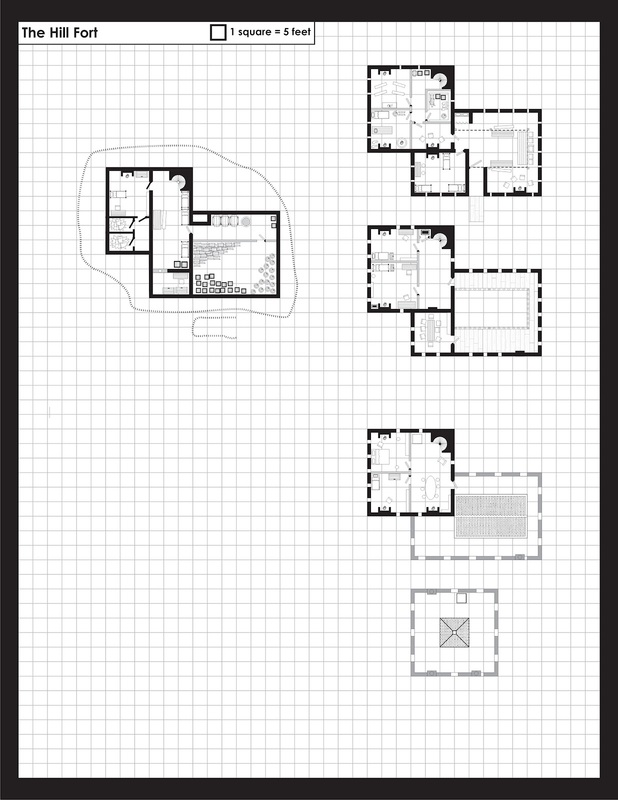 The original map were draw on five square per inch graph paper and was a bit dense. So to make his project easier I redrew the maps and thought that the rest of you could find some use using it for your own campaigns. Also here is the original Hill Fort module. 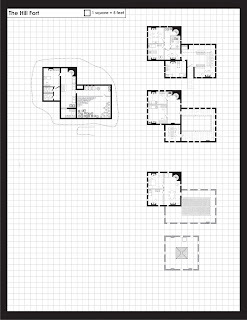 In addition to the normal size map (five square per inch at 5' per square) I blew it up to fives original size so it can be used as a battle map. The final paper size is 17" by 11" so it should be too expensive to take it to your local copying place to get it run off. Particularly that is it still greyscale. For all DCC RPG Fans note there is a resource thread over on the Goodman Games forums. It has a lot of useful material including consolidated reference tables. The Dungeon Crawl Classic RPG is a fun fantasy RPG with a distinct take on fantasy. I had a lot of fun refereeing it during the playtest period. One downside of the system is the numerous charts that need to be referenced. It not a flaw, they are an esstential part of how the DCC RPG plays, but still when you have lots of charts referencing them fast is an important part of managing a session. With the PDF one could just make cheat sheet and keep them handy but what would be the ultimate way of dealing with this is some Android or iOS app to have them at your fingertips. Well the guys at Purple Sorcerer Games are doing just that. Not only making an app but apps for iOS AND Android. They have a kickstarter project to raise some funds to get the equipment and capital make the Crawlers Companion. A nice touch is including some of the adventures they wrote for the DCC RPG at various backer level. In the late 70’s and early 80’s roleplaying games became a popular pastime. Since then many new games and new editions of old favorites have been released. But unlike that old Apple 2 or Commodore 64, games don’t wear out or become obsolete. They are still as much fun to play today as they were back in the day. In 2000,Wizards of the Coast released the 3rd Edition of the world’s most popular roleplaying game. In addition they released much of this edition under the Open Game License so that third party publishers could release products. This document had 90% of what is needed to play prior editions. In 2006, the OSRIC team released the first retro-clone of an older edition. Now six years later every older edition has a retro-clone including many other roleplaying games that are variations. Taking the older editions in different directions that the original authors didn’t have the time or interest for. The games listed in this primer are only a handful of the many that are available. For a person new to this it can all be confusing. The games selected in this primer are in the author’s judgment are representative of the OSR. After examining and playing these games you will find there is a incredible variety of other games, supplements, settings and adventures to choose from. wanting to see what it was all about. In the words that closed the first ever roleplaying game. Look on Dragonsfoot.org and RPGNow for free or inexpensive adventures to use. I designed a one page fold up pamphlet that you can download from here. I am releasing this and the art to the public domain for everybody to copy and use. It includes a nifty cover along with a blank fourth pages that folks can customize to advertise their product or point out materials that I didn't. I feel this pamphlet will get a novice up to speed quickly, explain why things are the way they are and a straightforward method of sampling the diverse material. I apologize if I didn't put your product on the list. Of my own material I only mentioned Blackmarsh because it is free to download. D&D Next: Starting at higher levels. One of the many debates floating around the internet about DnD Next is about the starting power of characters in a DnD style game. 3e boosted the capabilities of starting characters and 4e takes that up several notches higher. When I first played 4e I felt like that 1st level 4e characters were about as capable as a 5th level classic edition characters. To me, the DnD Next playtest dropped characters back to roughly were they were with 3e.Which for many classic edition fans is still too high. During these debates about starting character power, one common response from classic edition gamers is to simply start at a higher level. 3rd or 5th if you don't want to endure the low level lethality of a classic edition game. Unlike Hero System or GURPS where there rarely an issue with suggesting that a campaign starts at a higher or lower point level, it seems that this suggestion is met with skepticism and dislike by gamers regardless of edition. The general feel of the response make it sound like it would be cheating to start a campaign at a higher level. So do you readers think that accurate? That while intellectually we know we can start campaigns at higher levels it feels like cheating? Depending on the campaign, I develop quite a bit of detail on some aspect of the Majestic Wilderlands. For one campaign I fleshed out the details on the religion of Silvanus the Forest Lord. Then last year for the Gold Star Anime campaign I turned it into a booklet for one of my players. Last week I realized that I never posted it for the rest of you to use. You can download the Gods of the Majestic Wilderlands, Silvanus from here. It also includes the relevant information from the Majestic Wilderlands for Swords & Wizardry. One interesting thing about this particular bit of writing is that highly modified it served as the basic background of the NERO LARP chapter I ran a few years back. I got rid of the religious aspect and focused on the the rangers. Creating a code to express the philosophy of the Rangers. The players liked it a lot and more than a few of them decided to become members of the Rangers. You can download the packet from here. Because of the D&D Next playtesting. In a nutshell people are finding that a D&D Next playtest campaign works best when you manage it in the same manner as a classic D&D campaign. Starting with last year's D&D Experience, classic style gaming has been reintroduced into a far larger audience than myself or any of the OSR publishers could have done. Already my long tail sales of Majestic Wilderlands and Blackmarsh have shown an uptick over the past six months. Before I was getting maybe 4 or so, now I am getting 10 or more sales a month. The AD&D reprints are just the icing on the cake. Not only the gamers will get their hand on the original books but also there are dozens of products readily available for those books. Now I am realistic about this. Victory doesn't mean that OSRIC, Labyrinth Lord, or Swords & Wizardry, or any other retro-clone is going to compete head to head with Pathfinder or D&D Next. The impact of this is that the classic editions of D&D will have enough gamers behind it to keep it a living game with a vibrant community supporting it for a long time. Which to me is the point of all this to begin with. And if it turns out that D&D Next continues to be compatible with classic edition D&D, well that just makes it easier. And to keep D&D Next compatible is the main reason I am involved. Not just because I like older editions, because that means all the stuff I wrote will be usable as is for D&D Next gamers. And for you OSR gamers reading this this means your writings too. The point of the original retro-clones was to get people publishing and playing classic editions of D&D. To preserve them for the next generation of gamers. That goal has been achieved and we are in the midst of a new golden age of classic D&D.